The works I have recently been looking at for my Female as Shapeshifter paper have been concerned with outlining proper codes of behavior for women, especially while they were with child, for fear that their conduct would effect their unborn babies. The two prior pieces both relied upon excessive consequences for improper behavior, almost as scare tactics to keep women in line. However, there is another facet to this genre that sidesteps fear inducing literature and appeals to simple common sense and human decency, and most interestingly, the participants of this genre are mostly women. I am referring to the mother’s manuals, and one of the most popular in the seventeenth century was Dorothy Leigh’s The Mothers Blessing, first published in 1616 (and countless times thereafter). She positions her work as the domestic duty of a mother to instruct her children, humbly acknowledging her status in society. However, through the very act of publication she also acknowledges her ambitions in society where her words would reach well outside her domestic sphere as she inserts herself within the male dominated print culture – “a thing so unusual among us,” meaning women. Less than fifty years later there would be dozens of works published by women as they were beginning to understand the importance of this medium to impress their voices. Further evidence of Leigh’s desire for immortality through the press, along with a global audience lies in her many examples for female conduct, despite having had only sons. Arguably she posits these tidbits of advice as being reserved for the future wives of her sons, but that too stretches her influence well beyond the ordinary role of the mother whose sons’ wives’ obedience was expectantly their husbands’ alone. Yet while this aspect of publication is fascinating, it resides well outside the scope of my paper (and I will be the first to admit I often need to be reigned in from pursuing adjacent and equally interesting topics), and unfortunately I don’t think I will have time for this in my fifteen minute presentation. Thus I will refocus on the aspect of childbearing and the implications of this enterprise for women. 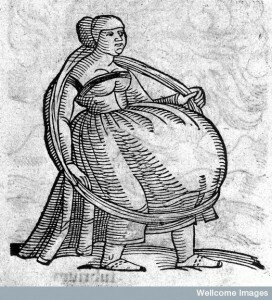 Leigh obviously believed the mother’s comport while pregnant effected the child, but in a different manner, where she equated giving birth almost in terms of a Marian feat, and the mother’s conduct influenced the baby well outside of the womb, not in some supernatural sense where the mother’s fashion choices altered a baby’s appearance, but rather that the mother served as a role model and guide for her children and thus must have always been cautious with her piety, never straying from the ways of God. L0005357 Woman bearing 20 children. Franciscus Picus Mirandolae, quoted by pare, says that one Dorothea, n Italian, bore 20 children at 2 confinements, the first time bearing 9 and the second time 11. He gives a picture of the marvel of prolificity, in which her belly is represented as hanging down to her knees and supported by a girdle from the neck. (Gould and Pyle). Leigh at one point in her writing referred to nursing her babies in Christological terms, likening the process to infusing the baby with blessings and life blood. This too referenced an anxiety of the early modern period that viewed breast milk as a potentially corrupt and subversive element. Much like Leigh believed she was pouring goodness into her babes mouths, others’s beliefs were much more nefarious. 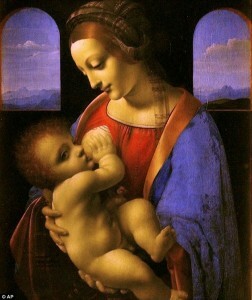 In Juan Luis Vive’s Education of Christian Women (1524), he presents the duality of breast milk as admirable nourishment on the part of those women who did not opt for a wet nurse simply out of convenience, but also regarded it as possibly harmful as it passed along the mother’s temperament and even more dangerously, her impurity. However, this did not negate the existing hazards of allowing a wet nurse access to a malleable baby, as she too could negatively influence him through her milk. Clearly there was no winning strategy and it must therefore be understood that female interference in a baby’s life, from conception in the womb well into the infant state was a disruption in patrilineage, and even the best intentions were frighteningly the reflections of maternal agency. Thus it can be surmised that the woman’s role in society was to remain as unobtrusive as possible, dispelling male fears based upon their utter dependence upon women for promulgating and identifying lineage. Therefore despite Leigh’s clear indication of the importance of instructing children, and essentially dictating their upbringing through the creation of written accounts, her work served as an example of the friction between ideology and practice.